The drug is the dried whole herb of Filifolium sibiricum (L.) Kitam. 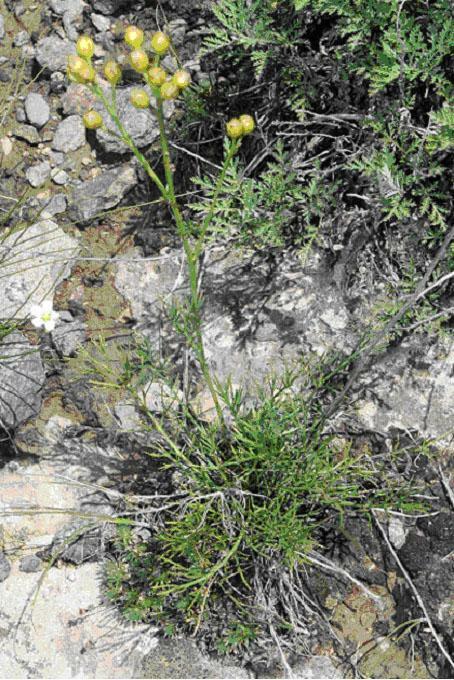 (family Compositae), growing on grasslands, pastures, and meadows, distributed in Heilongjiang, Jilin, Liaoning, Inner Mongolia, Hebei, Shanxi of China. The whole herb contains volatile oil, flavonoids, filifolin, eriodictyol, 3, 6-dimethoxyquer cetagetin, triterpenes, phenols. It is used to clear away toxic heat, regulate menstruation, stop bleeding, induce tranquilization; for the treatment of high fever, palpitation, insomnia, leukorrhagia, sores, furuncles and carbuncles, chronic ulcer of lower extremity, otitis media. Decoct 9~15 g. Proper dosage is for external application, made into paste for applying.